State Schools Lack Funding. Who Loses? We all do. Undue vibrations, power spikes and grit give NASA pause. This study quantified the performance of a new alloy and has provided guidance for the design and development of next-generation gear steels. An experimental effort has been conducted on an aerospace-quality helical gear train to investigate the thermal behavior of the gear system. Test results from the parametric studies and the superfinishing process are presented. Vietnam is the war Americans don’t like to talk about. Even today, many of us struggle to understand the what and the why of that war. The complete Product News section from the March/April 2008 issue of Gear Technology. It’s safe to say Hannover Fair 2008 is big, and we’re not just talking square feet or the number of exhibitors/attendees. The complete Events section from the March/April 2008 issue of Gear Technology. It is with regret we report that Donald R. McVittie passed away January 20, 2008. 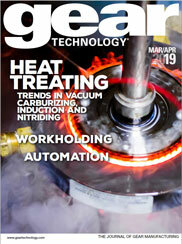 The complete Industry News section from the March/April 2008 issue of Gear Technology. Digital sculptor extraordinaire Tom Longtin has always had an interest in gears.